Buildings erected before 1871 were products of the brick mason and carpenter. The architects at the time were there merely for embellishment of the building. Much has been written about Chicago’s architectural history, with most of it taking place after the Great Chicago Fire of 1871. The catastrophe left behind a huge blank canvas that attracted the world’s greatest architects to show off their craft. However, other than a few stereographs of the burned out city, there seems to be a void of what this city looked like before the Fire. This Gallery is an attempt to recreate a vision of what the city looked like at this time. Many of the photographs in this site are being reproduced for the first time in almost eighty years! The Gallery is somewhat in aplhabetical order by street name. The Building Directory will help in locating an image of a partticular building. The best of the pre-Fire photographs (stereoscopes) were taken by John Carbutt, who had a studio at 24 Washington-street, just west of Wabash from 1861 till mid 1868 and at 131 Lake Street till 1870. It is reasonably sure that Mr. Carbutt sold out his Chicago studio and moved to Philadelphia about October or November of 1870 immediately after a fire destroyed the Drake Block in September. Mr. Carbutt issued a series of 195 Views of Chicago that were taken between 1864 and 1870.It seems that untill now, there has not been a comprehensive registry of these historically important images. Mr. Carbutt issued this set three times, and it is believed that each number he asigned remained with the subject. When known, Carbutt’s number will be indicated. Mr. Carbutt was born in England in 1832 and emigrated to the States in 1853. From 1853 to 1859 he worked as a photographer during the construction of the Grand Trunk Railway in Canada. He was reported to have been the first photographer in Chicago to take cartes-de-visite portraits. Cartes-de-visite were small visiting card portraits (usually measuring 4-1/2″ x 2-1/2″) and were in vogue till about 1860. These were replaced by the larger (6-3/4″ x 4-1/2″) cabinet views which remained popular till the turn of the century. He experimented with dry plates in his Chicago studio as early as 1864, and with magnesium light for flash in 1865. He ultimately introduced the first successful Gelatin-Bromide Dry Plates in 1879; the first Orthochromatic Dry Plates in 1886; first Celluloid Dry plates in 1888; and the first commercial X-Ray plates in 1896. He died in Philadelphia, PA in 1905. Another quality photographer was Silas Peter Melander, who had a North Division studio at 86 N. Clark (near Clark and Grand streets) with his brother Lewis, and by 1884 moved it straight north to 208 Ohio-street. Mr. Melander was born in Jönköping, Sweden in 1850 and came to this country two years later. He began to study photography at the age of 16 with Mr. Copelin, and he remained in Chicago after the Fire to become the official photographer of the Chicago Historical Society for many years. He retired in 1923, and died 2 May 1929. 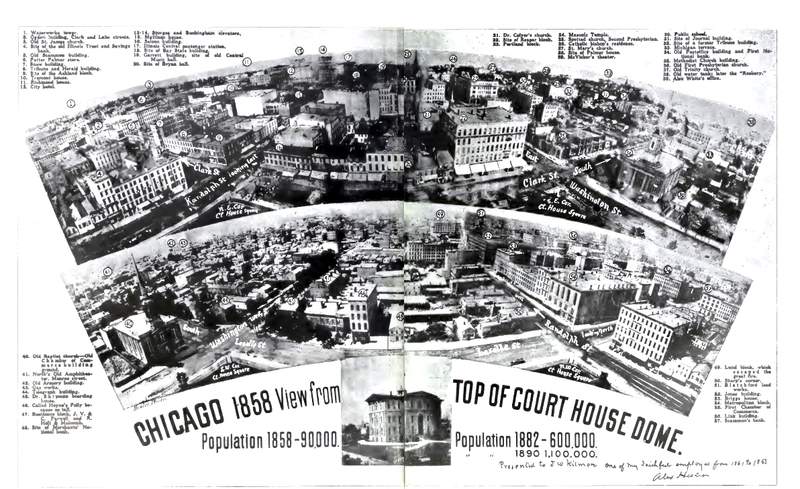 Alexander Hesler, who photographed a panorama of the city of Chicago from the the top of the Courthouse in 1857, was born in Montreal, Canada, July 12, 1823. At twelve years of age, he went to Vermont, and attended school until twenty years of age. He then came to Racine [WI] in 1843, and engaged in the hardware business for four years. In 1847, going to Buffalo. N. Y., he commenced his career as an artist, and in 1848-49 worked at Madison, Wis. In the spring of 1849, he went to Galena. Ill., and in 1853 came to Chicago and opened an art gallery in the Metropolitan Block, moving it in 1858 to No. 113 Lake Street, where he remained until burned out by the Great Fire of 1871. His residence was in Chicago until 1865, when he moved to Evanston. After 1871, he opened a gallery in Evanston which he continued until 1879, when he moved it back to Chicago, to No. 96, State Street, where he has since been actively engaged in the practice of his profession. Edwin Whitefield (1816-1892), an artist who devoted his life to making drawings of the more important or historically significant cities of the United States and Canada, created seven views of Chicago between 1860-63. In general, he chose eastern U.S. cities as his subjects which included Chicago, Galena, Minneapolis, Steubensville and Cinicnnati. The Gallery includes several of Mr. Carbutt’s and Mr. Melander’s photographs. A couple of Mr. Whitefield’s engravings are in the process of being added. 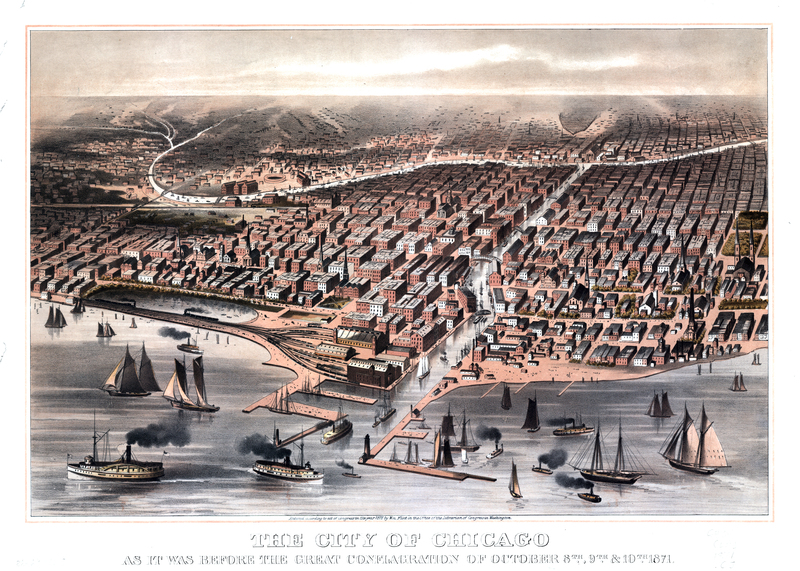 Probably the most important images of Pre-Fire Chicago was created by a 13-issue run of Chicago Illustrated which featured 52 color engravings of prominent buildings in Chicago during 1866. This Gallery is the largest on-line collection of Pre-Chicago Fire images in the world. Below is an alphabetical listing of the images. 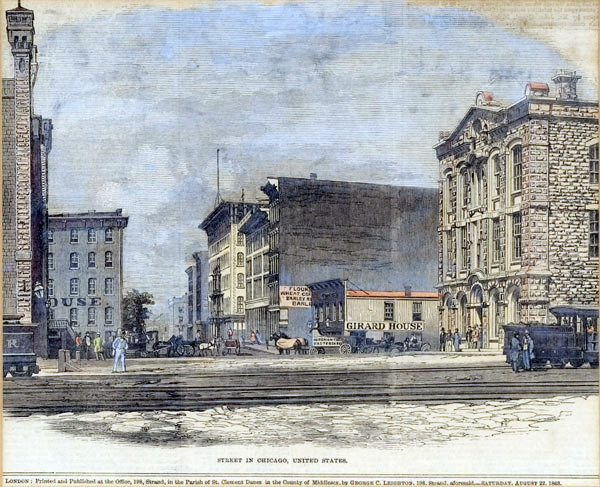 From left: Larmon Block (at NE corner of intersection); First Methodist Episcopal Church (Chicago, IL: 1858), under construction; Mechanics’ Institute Hall (SW corner).